Graph transduction methods label input data by learning a classification function that is regularized to exhibit smoothness along a graph over labeled and unlabeled samples. In practice, these algorithms are sensitive to the initial set of labels provided by the user. For instance, classification accuracy drops if the training set contains weak labels, if imbalances exist across label classes or if the labeled portion of the data is not chosen at random. This paper introduces a propagation algorithm that more reliably minimizes a cost function over both a function on the graph and a binary label matrix. The cost function generalizes prior work in graph transduction and also introduces node normalization terms for resilience to label imbalances.We demonstrate that global minimization of the function is intractable but instead provide an alternating minimization scheme that incrementally adjusts the function and the labels towards a reliable local minimum. Unlike prior methods, the resulting propagation of labels does not prematurely commit to an erroneous labeling and obtains more consistent labels. Experiments are shown for synthetic and real classification tasks including digit and text recognition. A substantial improvement in accuracy compared to state of the art semi-supervised methods is achieved.The advantage are even more dramatic when labeled instances are limited. The graph transduction based semi-supervised learning methods consist of the crucial steps: graph construction and label diffusion on graph, as shown in the following demonstration. While the above univariate formulations, which merely treat the F as variable for optimization, remain popular and have been empirically validated in the past, it is possible to discern some key limitations. First, the optimization can be broken up into a separate parallel problems since the cost function decomposes into terms that only depend on individual columns of the matrix F. Because each column of F indexes the labeling of a single class, such a decomposition reveals that biases may arise if the input labels are disproportionately imbalanced. In practice, both propagation algorithms tend to prefer predicting the class with the majority of labels. Second, both learning algorithms are extremely dependent on the initial labels provided in Y. This is seen in practice but can also be explained mathematically by fact that Y is starts off extremely sparse and has many unknown terms. Third, when the graph contains background noise and makes class manifolds nonseparable, these graph transduction approaches fail to output reasonable classification results. These difficulties were illustrated in below (improper edge weights, over connected graph, uninformative labels, and imbalanced labels) and seem to plague many graph transduction approaches. However, these challenges motivated us to propose a more robust method, graph transduction via alternating minimization (GTAM). Though there exists some advanced optimization procedures of the above nonlinear MAXCUT problem, here we use the greedy gradient search to achieve the computational efficiency for practical applications. A demonstration with artificial data of the sensitivity graph transduction exhibits for certain initial label settings. The top row shows how imbalanced labels adversely affect even a well-separated 2D two-moon dataset. The bottom row shows a 3D two-moon data where graph transduction is again easily misled by the introduction of a cloud of outliers. Large markers indicate known labels and the two-color small markers represent the predicted classification results. 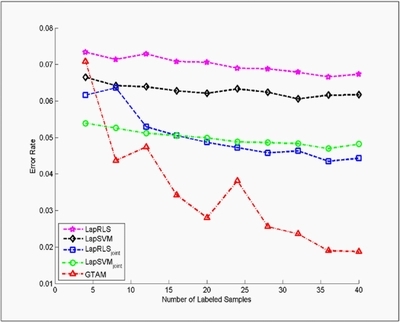 Columns depict the results from (a) the GFHF method; (b) the LGC; (c) the LapRLS method; (d) the LapSVM method; and (e) Our method (GTAM). The WebKB dataset contains two document categories, course, and non-course. Each document has two types of information, the webpage text content called page representation and link or pointer representation. For fair comparison, we applied the same feature extraction procedure as discussed in previous work, obtained 1051 samples with 1840-dimensional page attributes and 3000 link attributes. The graph was built based on cosine-distance neighbors with Gaussian weights (number of nearest neighbors is 200). We compared our method with four of the best known approaches, LapRLS, LapSVM, and the two problem specific methods, LapRLS_joint, LapSVM_joint. All the compared approaches used the same graph construction procedure and all uniform parameter. We varied the number of labeled data to measure the performance gain with increasing supervision. For each fixed number of labeled samples, 100 random trails were tested. The means of the test errors are shown in the following Figure. We also evaluated the proposed method in an image recognition task. Specifically, we used the data in "Learning with Local and Global Consistency" for handwritten digit classification experiments. To evaluate the algorithms, we reveal a subset of the labels (randomly chosen and guaranteeing at least one labeled example is available for each digit). We compared our method with LGC and GFHF, LapRLS, and LapSVM. The error rates are calculated based on the average over 20 trials. Last updated: May. 11, 2009.